A day before the concrete truck was scheduled to lay the foundation of Ruth Braly’s home, a small group gathered at the half-acre jobsite in Homewood. Among them were laborers, members of the design team, architect Cole J. Butler and the owner. Objects—stones, shells and crystals—were laid at the four compass points, the threshold and the place where Braly’s bed would be. Braly moved to Tahoe’s West Shore in 1983, where she owned and operated the Cedar Crest cabins until 2007, when she decided to retire and build a home. A friendship with Basque builder Iban Aranzabal led her to the idea of building with a natural approach—organic, sustainable, in harmony with nature. Aranzabal designed the home’s key concepts, including the circular, shell-like shape, the straw bale construction and the living roof. “The straw bale wall system is, in my opinion, far better than a fiberglass-filled stud wall in regards to insulation, thermal mass, longevity, beauty and closeness to ourselves, as organic living tissue,” says Aranzabal. However, Aranzabal admits he had little more than “theoretical knowledge” regarding straw bale and living roof construction and had never before designed a home. “We jumped into the river and then learned how to swim,” he says. The house was in the design process—obtaining permits, navigating building codes, creating three-dimensional CAD drawings and educating public officials on natural building—for two years. After laying the foundation in 2007, the first step was to erect the timber frame and roof immediately in order to keep the straw dry. The bales, made from rice farming byproduct, were covered in plaster, creating a highly energy-efficient envelope. 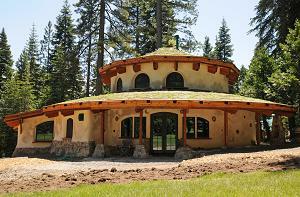 The earthen living room floor was topped with seven coats of oil and three coats of wax, and the walls throughout are a mixture of lime, clay and sand; Grass Valley-based Lori Wright created all the plasters on site, mixing them with natural pigments. The living roof’s plants subsist on storm water collection: wildflowers blossom through the summer, and sedum often blooms into the winter. Whimsical details abound: orange, blue and white tiles decorate the upstairs kitchenette; glass set in a nearby wall provides a sunlit show by day and vibrant reflections at night. On an exterior wall above the front door, shells and other nautical objects suggest the sea. “Ruth has the ocean in her history,” says Butler of Braly, who with her husband opened the first sport diving school in San Francisco in 1957. Despite the home’s capricious nature, it’s also practical: The upper floor can be converted into space for a live-in caretaker, when the time comes.